Part of my travels in outer Nastrovia (yes, I made that up - it's really a toast in Russian), I had a chance to participate in entomophagy. What's that? Technically, it is the practice of eating insects, although for some reason, things like worms and spiders and scorpions are lumped into that category. Oddly enough, the same people who would likely find the practice disturbing have no problem chowing down on lobsters - despite the phylogenetic relationship. Just imagine them as small lobsters. Small, terrestrial, flying lobsters. 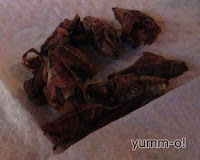 In this case, we had the chance to try some fried grasshoppers (chapulines) in a mezcal shop. The critters were crunchy, a little sour ... not really all that appetizing, really. I understand that they're usually packaged with cheese in a taco. But for a first shot, I was a little disappointed. 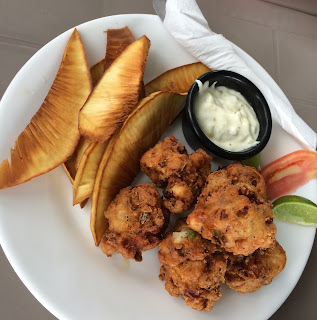 We have a place in town that sells crunchy fried mealworms - that doesn't appeal to me all that much. I'd really like to try sago grubs some time, though. 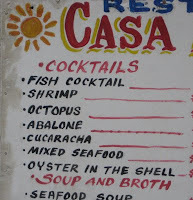 No, I am not sure I am ready for a cucaracha cocktail, though. Grubs cross an imaginary line for me. All I can imagine is the moment in Man v Wild where he ate some type of grub and it burst all over his face. His expressions tell the whole store. Fried pastry cream? Yes, thank you!